Supporters converging on Starks Park will have been concerned by the heavy rain that had fallen all day. Thankfully it eased off as kick off approached when the culmination of hard work behind the scenes came to fruition. A lone piper stood in the centre circle as the clouds parted revealing a portion of blue sky as the sun came out. It was more than fitting considering the events being commemorated with McCrae’s Battalion Trust and all those involved deserve credit and the improvement in the weather. 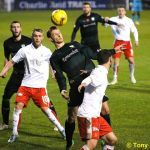 Turning to the match the Rovers starting eleven saw two changes; Jason Thomson was replaced by Toshney moving over to the right back spot. Iain Davidson slotted into the back four at centre half with James Craigen coming in with Mitch Megginson. Grant Anderson moved to the bench. 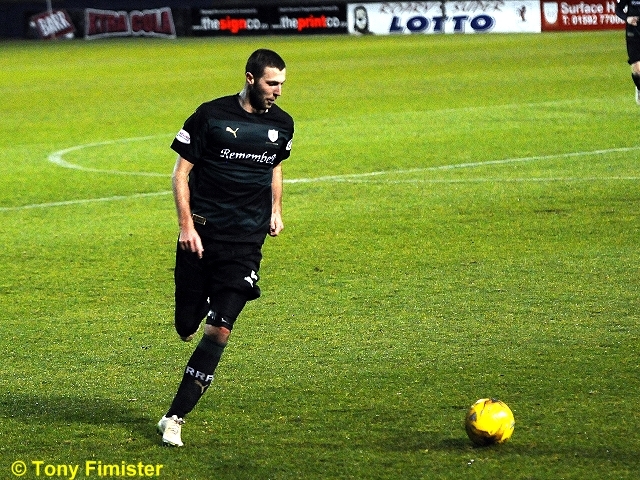 Falkirk had two ex-Rovers in their eleven in John Baird and Paul Watson and ex-loanee David Smith on the bench. 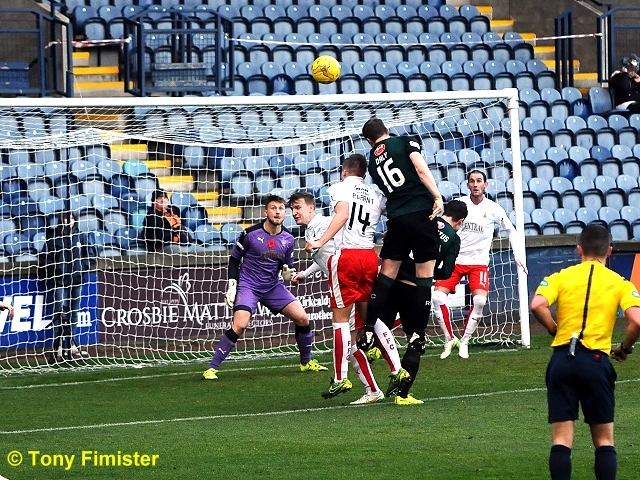 The first incident saw a sharp intake of breath from the home fans when Toshney’s header back to Cuthbert went just past Falkirk’s Sibbald who the Raith man hadn’t realised was behind him. Baird then had a shot from the corner of the box. 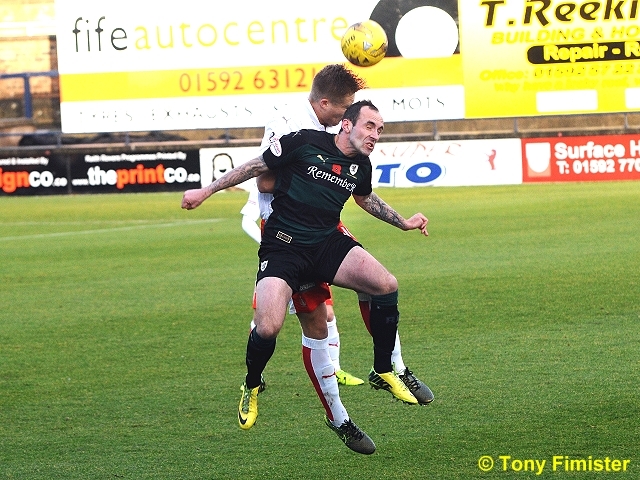 Mark Kerr put a free kick wide then Megginson’s effort was wayward. 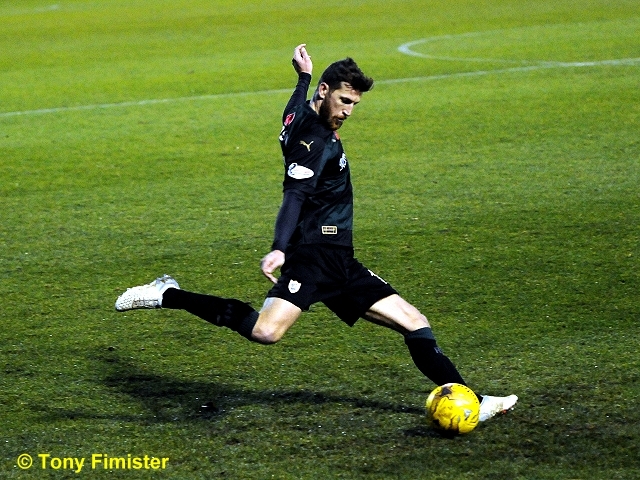 Falkirk had a free kick which was cleared but the second ball in was easy for Cuthbert to pick from the air. In the twelfth minute the first real opportunity fell to John Daly; he rose unchallenged and from six yards headed a corner wide. The underfoot conditions were making it more difficult for both sides and Megginson cross found Daly but a visitor managed to help it go past for a corner. 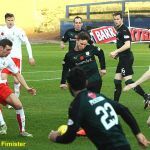 It took until the 27th minute before the first moment of really quality, James Craigen skipped past his marker on the bye line and smashed a shot at goal but Rodgers finger tipped it up and away for a corner. 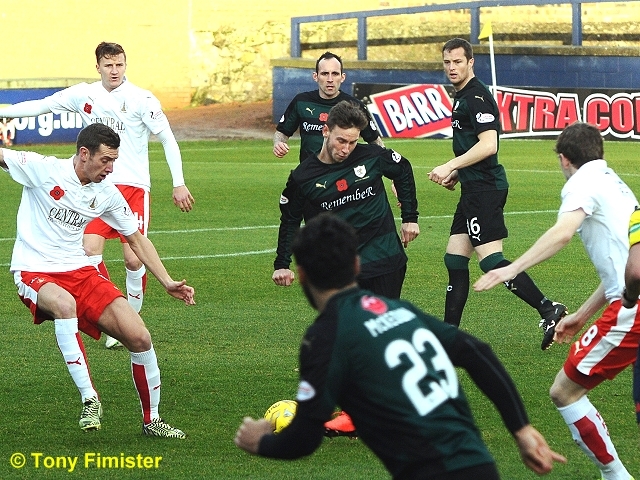 Megginson managed another dangerous cross but Stewart couldn’t get his head on it as the Rovers had a spell of pressure after Falkirk’s lively start. 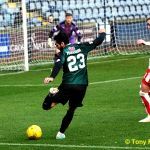 In the 39th minute the opener arrived in unusual circumstances, a long ball was knocked back by a Falkirk man to where he thought his keeper would be. Rodgers had however come to the edge of his box and the ball went past him to the glee of Stewart who was closing them down. 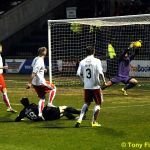 Mark Stewart then had the simplest of tasks putting the ball into the unguarded net to make it one nil. The Rovers fans had hardly finished discussing how it was about time they got a slice of luck at home when the visitors restored parity. 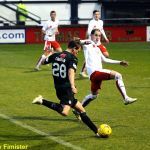 McHugh did well on the right and despite the close attention of Toshney crossed low, Blair Alston did even better to adjust and slid in at the far post getting enough on the ball to put it into the roof of the net. The game was tied again after only two minutes. 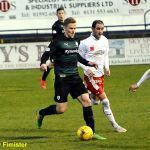 Spurred on the home men saw a low cross elude two green and black shirts in the visitors box before Muirhead was booked for stopping an on-rushing Raith man. Moments before Benedictus – who was Captain for the day – had lost his footing with a visitor at the edge of the box and some away fans a hundred plus yards away hoped it was a foul, those rather closer could see it wasn’t. John Baird’s constant work almost paid off in the 46th minute when his deft flick played in McHugh running at goal. His low effort went past Cuthbert hitting the foot of the post. 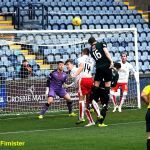 Toshney and Craigen combined with the later not quite getting hold of his shot as Falkirk tried to capitalise on the quality of their corner kicks. 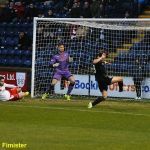 In the 50th minute Daly found Stewart who danced past his man and Megginson’s great cross just eluded Craigen sliding in at the back post as Alston had. Keeper Rodgers did well pushing away a low drive from Megginson then looked less self assured taking two attempts to claim a ball in traffic. 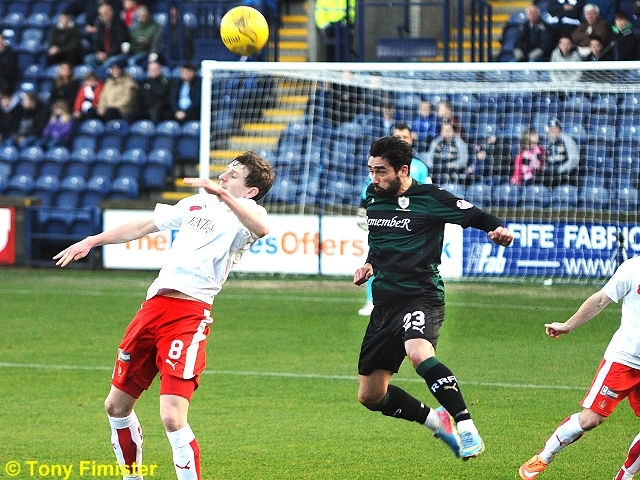 McHugh at the other end slid a shot past the post with Cuthbert beaten to the despair of the visiting support. On the hour the non-stop running of John Baird was rewarded when Davidson’s ball back to Cuthbert from wide was too short and the wee man was onto it in a flash. On the angle it was still not an easy task but the on form front man popped it past the home keeper to make it two one to the visitors. 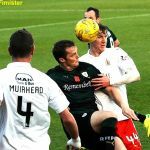 Robertson was booked for a handball then Kerr for a similar offence, the latter (being rather further away from the ball when it was struck) had much fewer grounds to claim it was accidental than the Internationalist. Three minutes later Kerr contested a header with Megginson vigorously and ended up on the damp turf, Mitch was not alone in being surprised when he was booked. 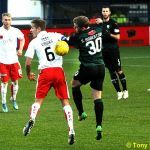 Efforts to get an equaliser were dented when McKeown went off with what looked like an injury, Petrie taking his place. 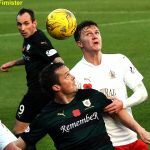 McCord and Toshney combined on the right but Stewart couldn’t get on the end of the cross then Robertson ran at the defence and the Rovers won another corner. 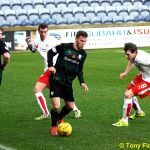 Rodgers was at last beaten in the 75th minute when Craigen’s low shot went past him heading for the bottom corner – somehow a sliding Bairn managed to hook the ball off the line and away to safety when it looked much easier for him to help it into the net. 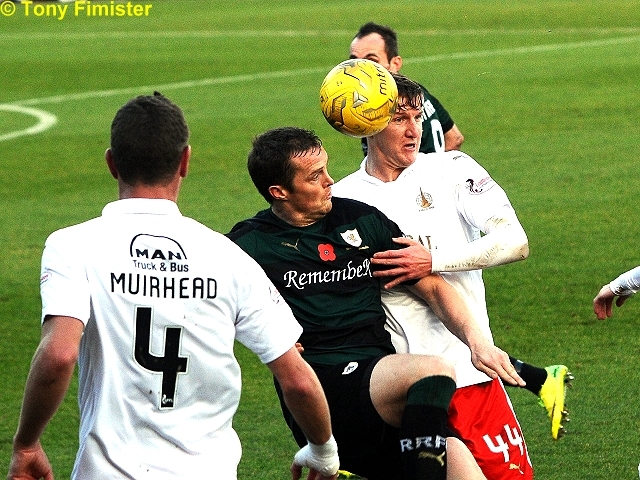 Rodgers was in no mood to be beaten again and did very well to push another Craigen effort around the post. The visitors had been maintaining a high line and at times been a little ponderous as they held onto the lead. With three minutes of normal time left Wighton flicked the ball over a defender and drove a shot at goal, Rodgers blocked it well and the ball went across the box past Daly who will have been disappointed not to be able to direct it goal ward. 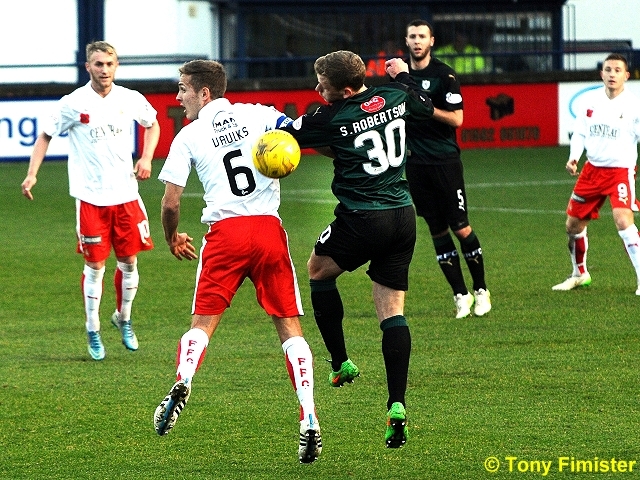 The game ended just after a less than subtle foul by Sibbald left the referee with no option but to book him. Welcome to all fans across the globe for today's match against Falkirk. It's been heavy rain for most of the day but the match goes ahead. Credit goes to the ground staff. 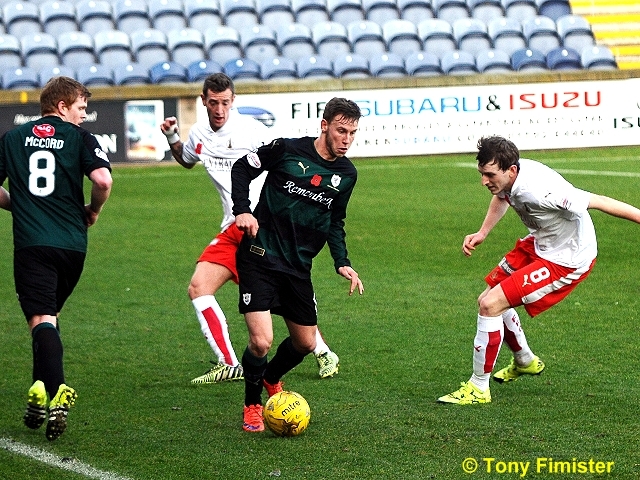 There are 3 former raith players playing for today's opposition. Baird and Watson start with Smith on the bench. 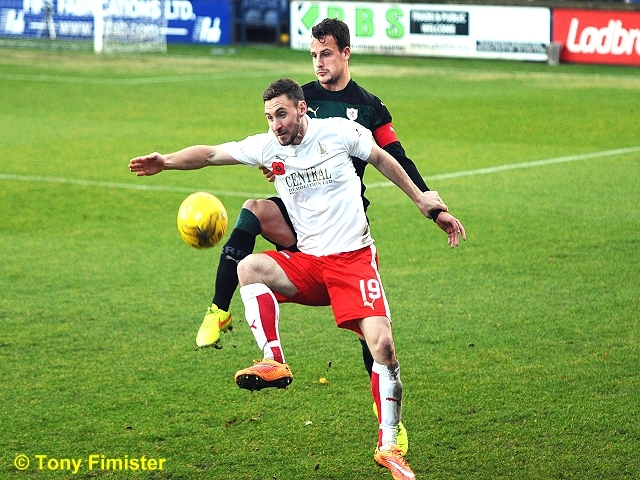 Raith will be looking to bounce back from two consecutive defeats. Today's visitors will prove tough opponents. The minute silence excellently observed by all fans and players. May we RemembeR. Falkirk kick off towards the south stand. 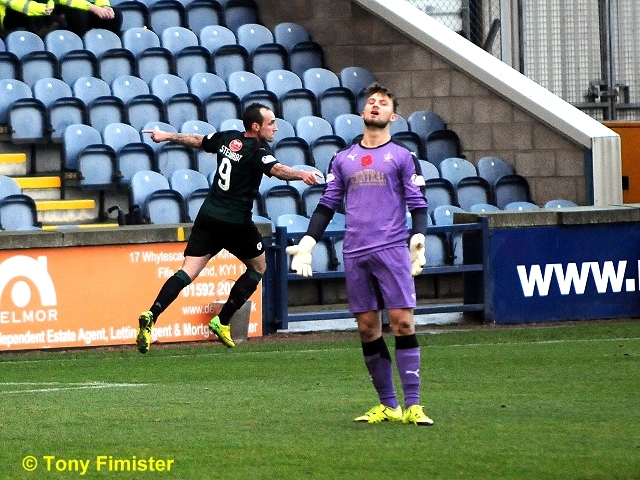 Iain Davidson with a slack backward header allows Baird a chance, his half volley from distance is held by Cuthbert. It's bright sunshine at Starks park now but also a very slick playing surface due to all that rain! A Vaulks free kick from distance goes well wide. A knockdown from Daly finds Megginson but his low shot is well wide. The rovers defence eventually scramble it clear. Corner to Falkirk. That man Baird again, his time volley easily gathered by Cuthbert. 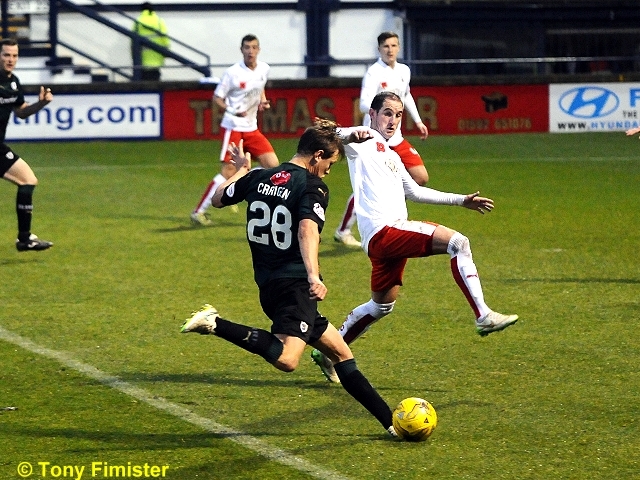 Corner Raith. McCord's delivery met by Daly but his tame header is well wide. Close for Raith there! Stewart's run and cross finds Daly sliding in but his effort is deflected wide. 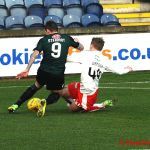 Stewart through again but a strong Watson tackle stops him in his tracks. It's a relatively even affair at the moment. Both sides are sizing each other up! Raith seem to be playing 3-5-2 but with plenty of movement between positions. Falkirk enjoying the majority of the play at the moment. Craigen's effort well saved. The subsequent corner is deflected wide. Rogers did well to turn over that Craigen effort. 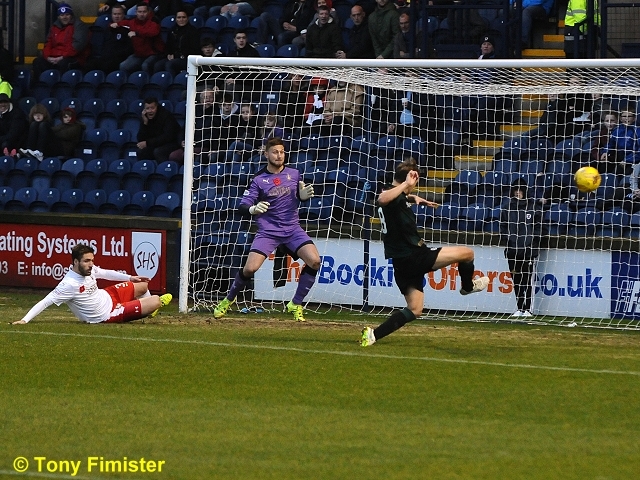 A strong Vaulks shot is deflected wide for a corner, which is well defended and cleared. 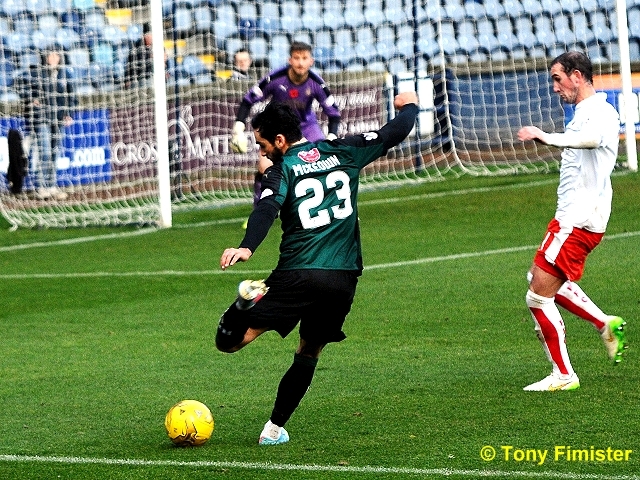 Free kick to raith near the far right corner flag. 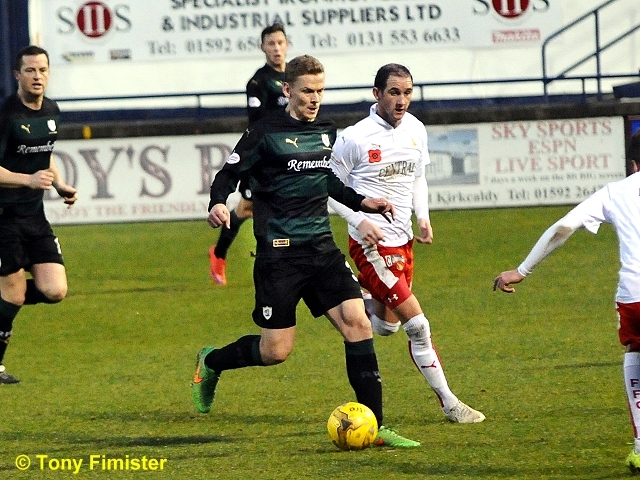 Taken by McCord but cleared by the Falkirk defence. 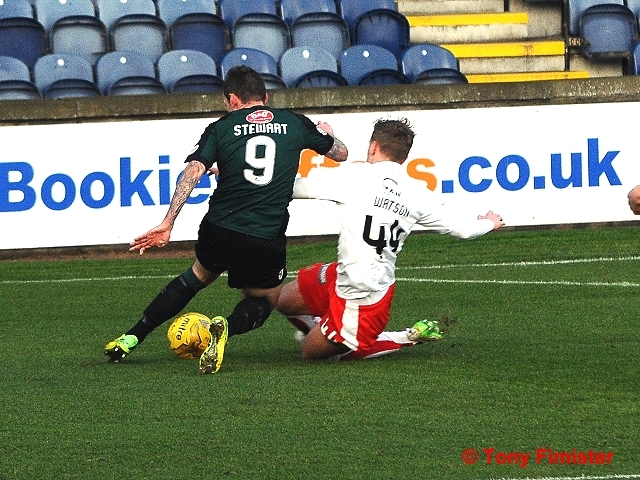 Rogers misjudged the ball and Stewart rolls it into the empty net! 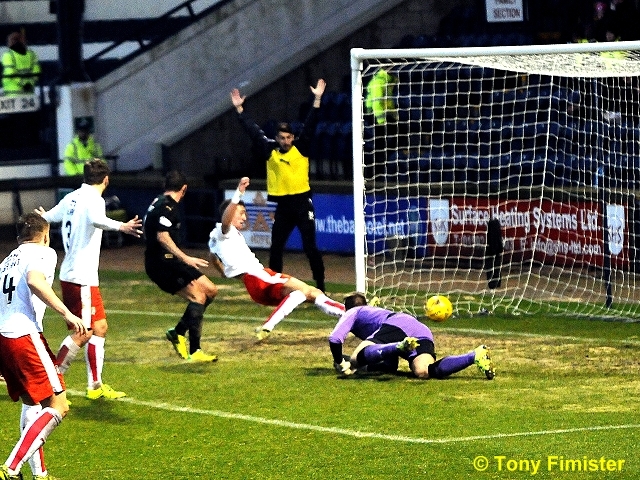 Goal, Falkirk. Alston stretches to connect with the cross and beats Cuthbert. It's end to end action here. Mark Stewart wins a free kick 25-30 yards from goal. 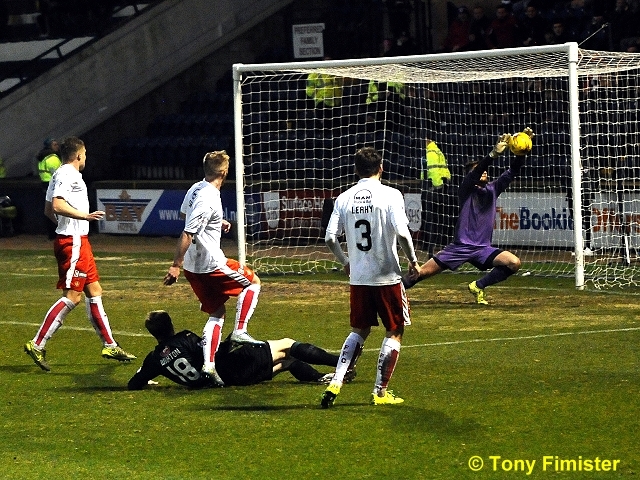 Craigen's effort is blocked by the Falkirk wall. 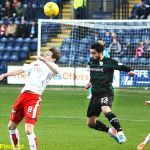 Raith slightly shading possession, shots, corners and even fouls! But it's all even at half time! Goal Falkirk, John Baird. Davidson's back pass out Cuthbert under pressure, and Baird finished well. Craigen shot cleared off the line by Muirhead - looked in! 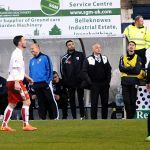 Falkirk are the visitors to Stark’s Park this weekend, and while Rangers and Hibernian have taken most plaudits in the Championship this season, the Bairns are also enjoying an exceptional campaign. 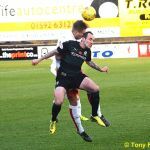 Peter Houston’s team have only lost two league matches to date, one each to the aforementioned sides, and currently sit third in the table, one place and three points above Raith Rovers. 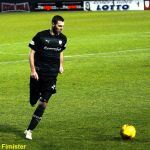 Part of that success is down to the form of a striker who is very familiar to Raith fans in John Baird, who has already scored 9 goals this season in all competition. 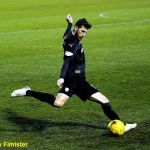 He arrived at Falkirk from Queen of the South midway through last term, and the front man has proven to be an astute addition to Falkirk’s roster, with 14 league goals in 28 starts. 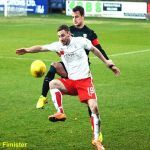 While Baird is in a rich vein of form, it was another former Doonhamer who made the difference the last time the two teams met, with Mark Kerr scoring the only goal of the game in a tight struggle at the Falkirk Stadium in August. 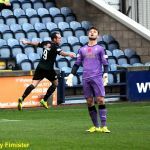 That victory continued Falkirk’s fine record in this fixture, with Raith only winning one of the previous eleven league meetings, a 1-0 win in December last year, thanks to a Ryan Conroy goal from close range. 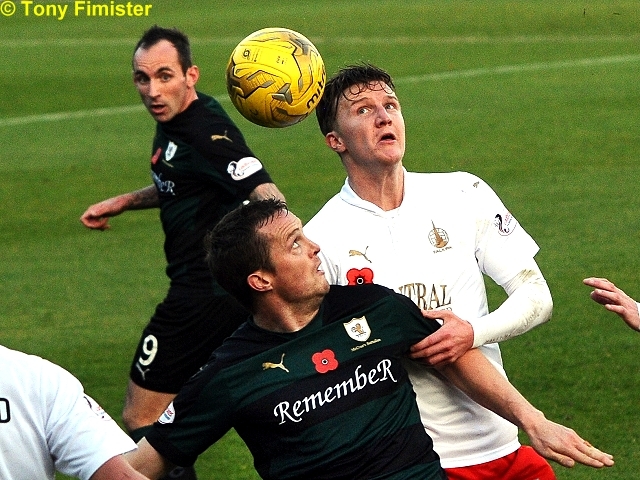 Raith’s last victory over Falkirk at Stark’s Park came back in September 2013, when a last-gasp Greig Spence goal was enough to see Rovers advance into the semi-finals of the Ramsdens Cup. 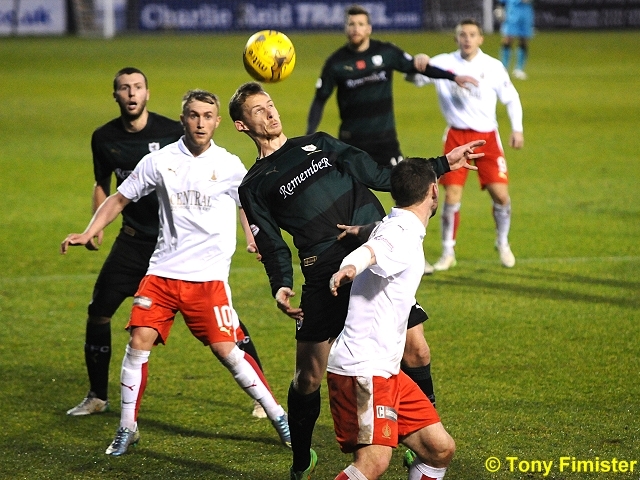 You have to go back even further for Rovers last home league win over Saturday’s opponents, November 2012, when David Smith and Grant Anderson scored the goals to secure a 2-1 win. 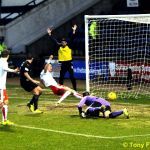 Since then, Falkirk have went five Championship matches unbeaten in Kirkcaldy, their longest unbeaten league sequence in Kirkcaldy. Saturday’s match referee will be Nick Walsh.